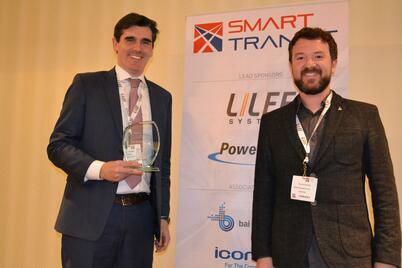 Masabi is pleased to announce that the JustRide Platform, which has brought mobile ticketing to some of North America's largest commuter networks this year, was named Transit App of the Year at the prestigious 2016 SmartTransit Congress on Oct. 26. Chris Dempsey, Masabi's Vice President for North America, was on hand to accept the award. "I’m extremely pleased that JustRide has won the SmartTransit Innovation Award for Transit App of the Year, which recognizes its impact in helping people move around cities across North America,” he said. "We developed JustRide to benefit riders and agencies alike and are delighted to have been presented with this award." The award acknowledges "the best app currently on offer to transit passengers in North America," and the criteria included the quality of the idea, its creativity and originality, the implementation and design, usability and improvement to passenger experience." The selection of JustRide is a testament to the app’s continued success in North America, where it has seen phenomenal growth over the past year. The recent expansion into New York MTA’s Long Island Rail Road and Metro-North Railroad made mobile ticketing available for the largest commuter rail systems in the nation. For transit providers, the JustRide app replaces physical ticketing infrastructure that is costly to purchase and maintain; it can be rolled out quickly and scaled as needed. The app provides data that transit agencies can use to forecast demand and adjust services to maximise passenger satisfaction. JustRide was also designed with deep-linking APIs, so it can be connected to applications for other city services – such as bike share, route planning and taxi hailing, helping create frictionless door-to-door journeys. You can read the SmartRailWorld award announcement article here: Who has won the 2016 SmartTransit Innovation Awards? Learn more about the JustRide app here.